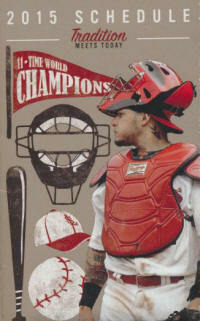 Molina earns another Platinum Glove award! Heyward earns Wilson Defensive Player award! Molina, Heyward earn Gold Glove awards! 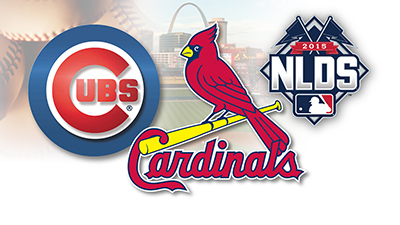 Cardinals rookie Stephen Piscotty homered for the second straight game and the third time in the NLDS. In doing so, he became the only rookie in Major League history to homer in three of his first four career postseason games. Matt Carpenter became the third Cardinals player to hit a leadoff homer in the postseason, joining Lou Brock (1968 World Series) and Fernando Vina (2000 NLDS). Carpenter now has five homers and nine RBIs over his past 11 playoff games. All have come out of the top spot in the order. Only six players in history have produced more postseason leadoff homers over their careers. Tommy Pham joined an exclusive group by crushing a pinch-hit home run in the eighth inning. By doing so, he became just the third player all time -- and the first since John Lowenstein in the 1979 ALCS -- to hit a pinch-hit homer in his first career postseason game. The only other player to do so was Dusty Rhodes in the 1954 World Series. With Pham's homer, the Cardinals are now responsible for three of the four postseason pinch-hit homers since 2013. Along with Pham's eighth-inning blast on Friday, Shane Robinson hit a pinch-hit homer in Game 4 of the 2013 NLCS, and Oscar Taveras added one in Game 2 of the 2014 NLCS. The only other postseason pinch-hit home run across the Majors in that span came from Michael Morse, who hit it for the Giants -- against the Cardinals -- in Game 5 of last year's NLCS. 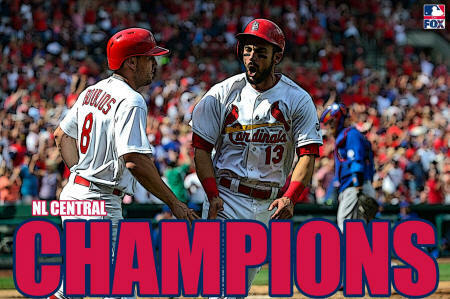 With the win in game 1, the Cardinals improved to 9-4 in NLDS openers all-time. Each of those previous eight times they won Game 1, they went on to win the series. 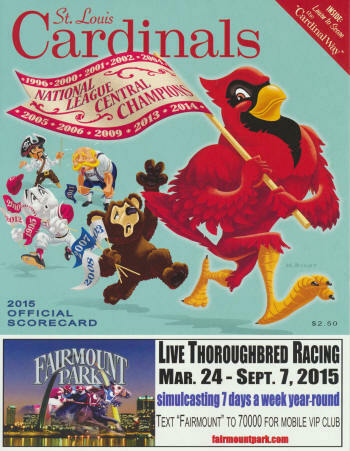 Until October 2015, the Cards hadn't had a losing month since June of 2012! That's 39 consecutive months of winning basebal! Wow! Mike Matheny is the only manager in baseball history to lead his team to the post season in each of his first four full seasons. 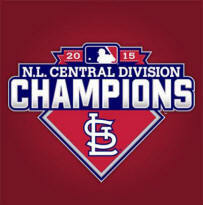 Cards took control of first place in the NL Central on April 17th and never relinquished it! 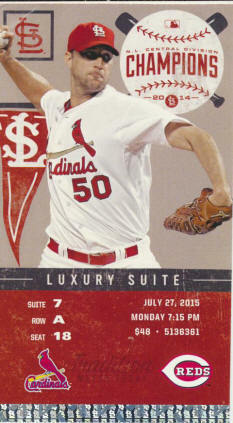 Grichuk hits 17 home runs and Matt Carpenter hits 28! Rosenthal sets a franchise record of 48 saves! I don't know too many other clubs that could have withstood all the injuries the Cards did this season and still come out on top! 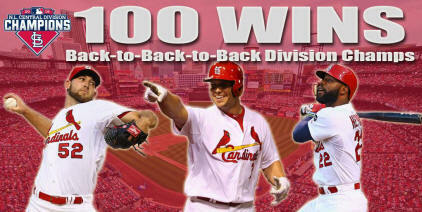 (100 wins too!) 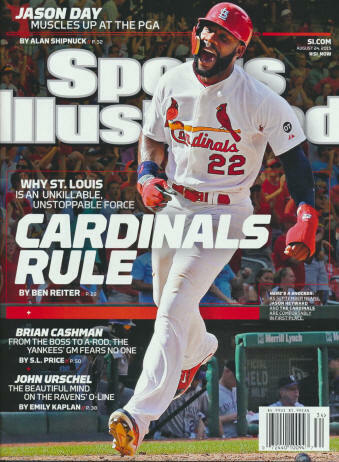 Just to recap... Adam Wainwright (most of the season), Yadier Molina (late September), Randall Grichuk (two stints on the DL), Matt Holliday (two stints on the DL), Matt Adams (most of the season), Jordan Walden (most of the season), Matt Belisle (most of the season), Lance Lynn, John Jay, Jaime Garcia. The Cards had 25 come from behind wins in the first half of the season. At one point in the season (early) Jaime Garcia had seven consecutive quality starts and a 1.69 ERA. At the break, Carlos Martinez is 9-3, and the Cardinals are 14-3 in his starts. Matt Holliday reached base in 45 straight games to open the season � both a National League and Cardinals franchise record. 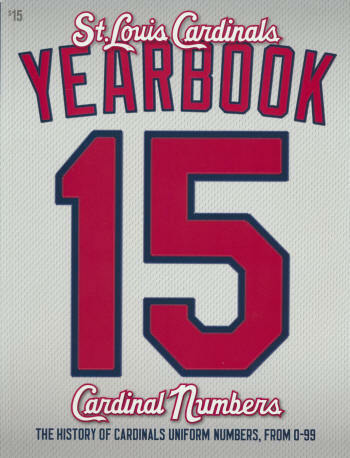 Fans vote Stan Musial, Lou Brock, Bob Gibson and Rogers Hornsby as the Cardinals "Franchise Four"
5 consecutive years in the postseason!!! 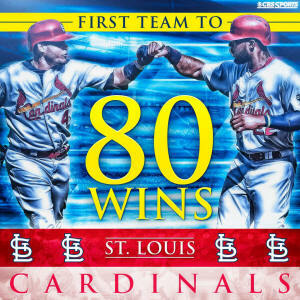 Cards off to their best start in modern franchise history (20-6)! Carpenter earns player of the week honors!